Professor Raúl Carrillo-Arciniega’s “El poema definido por sí mismo: entrevista con David Huerta” has been published in the most recent issue (9.2) of Hispanic Poetry Review. From June 15-June 21, Dr. Emily Beck traveled to the Hispanic Society of America inNew York City to consult a series of original 15th-17th-century Spanish and Catalan manuscripts. Her current research project engages the “Mirror of Princes” literary genre, a series of texts that offers advice on how to be a good ruler and leader, the most famous example of which is probably Machiavelli’s The Prince. Prof. Beck’s project examines this genre in the context of significant social changes occurring during these centuries in theIberian Peninsula. Of particular interest to this project are those manuals and treatises written for noble daughters and the advice given to women such as Queen Isabel I and other powerful noblewomen to navigate politics, finances, and court life during the early modern period. During mid-May, Dr. Benjamin Fraser traveled to Madrid to research the topic of disability as part of his ongoing research project titled: “Disability and Spanish Cultural Production: Films, Novels, the Comic and the Public Exhibition.” His research trip coincided with the exhibition “Trazos Singulares”: the display of 60 paintings by some 30 artists with developmental disabilities on display at the Nuevos Ministerios metro station. As opposed to other exhibitions in which works of art are only displayed, here the artists actually painted in the station itself. Professor Fraser plans to complete a book project–which builds on essays published in the journals Cultural Studies and Hispania–during the fall semester of 2011, after which he will send the full manuscript out for review with a university press. With a grant from Global Scholars and funding from the Center for International Education and the Department of Hispanic Studies, in May of 2011, Dr. Sarah Owens traveled to Spain to conduct archival research on the works of women religious of the Iberian Atlantic World. She spent her time at the Biblioteca Nacional and the Archivo Franciscano Ibero-Oriental in Madrid and also visited the Biblioteca de Castilla de la Mancha in Toledo. Dr. Joseph Weyers recently returned from a seven week research trip to Uruguay. Building on his 2009 study that predicts the loss of academic tú in favor of a universal vos in Montevideo, Professor Weyers conducted over 400 linguistic attitude surveys to understand how quickly tú will be lost. At the same time, he documented the use of tú and vos in advertising to determine if publicity affects or reflects current usage. While in Montevideo, Dr. Weyers twice addressed teachers and students of English at the Alianza Cultural Uruguay-Estados about his work on language change as well as his work with fostering L2 oral proficiency. The compilation and analysis of the collected data is expected to be published shortly. Hispanic Studies Professors Collaborate in the AATSP Conference in D.C.
On July 5-9, 2011, Professors Mark Del Mastro, Luci Moreira and Jose Moreira, participated in the 93rd annual conference of the American Association of Teachers of Spanish and Portuguese (AATSP) in Washington, D.C. In his role as Executive Director of Sigma Delta Pi, the National Collegiate Hispanic Honor Society, Dr. Del Mastro presented an annual report to the AATSP Executive Council, conducted a Sigma Delta Pi Informative Session and presented the inaugural Mario Vargas Llosa Award during the Friday evening banquet. The Mario Vargas Llosa Award is a joint prize of Sigma Delta Pi and the AATSP that is granted annually to an outstanding undergraduate student of advanced Spanish in the U.S. Effective July 1, 2011, Dr. Robert Cameron (Ph.D., Florida State University) joined Hispanic Studies as the department’s new Basic Spanish Language Coordinator. 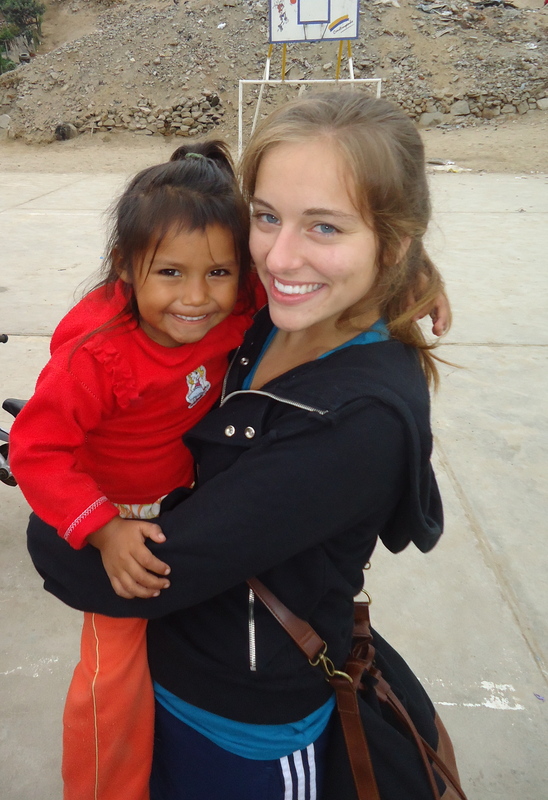 Dylan Kornegay (Spanish ’12) is spending her 2011 summer in Lima, Peru as an intern at Casa Hogar, a shelter for sexually abused and impoverished adolescent mothers and their babies. Dylan teaches English to the mothers once a week and cares for their children in the mornings while the mothers attend school. Dylan also coordinates weekend activities for both mothers and children. La Casa de la Gloria provides these young mothers with counseling and assistance to earn high school diplomas. The older mothers can attend cooking or cosmetology institutes to learn a trade. The ultimate goal is to provide an education that affords the adolescent mothers economic opportunities to support themselves and their babies, instead of returning to their past abusive environments. Click here for related CofC press release.